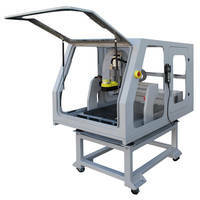 Titan Series CNC router features a user friendly, intuitive handheld controller, making set up quick and easy. The linear motion drive system is a product of precision machined steel framework. Equipped with precision linear rails and bearings, a 7-1/2" gantry clearance, 4HSP high frequency spindle (6,000 – 18,000 RPM), and an 11-1/2" Z-axis stroke, the Titan Series CNC router comes with 4HP high frequency spindle and a vacuum t-slot table work surface. The Titan Series CNC router is fully equipped with the best technology and tooling in the industry, and was made to meet any production needs. Techno CNC System’s new Titan Series CNC router features all steel construction, precision helical rack and pinion drives on the X and Y axes, and ball screw on the Z axis, and THK linear rails and bearings, with a 7-1/2" gantry clearance, and an 11-1/2" Z-axis stroke, the Titan Series CNC Router is also equipped with a 4HP high frequency spindle (6,000 – 18,000 RPM), and a vacuum t-slot table work surface. 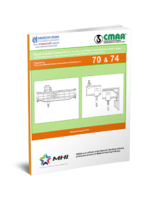 The precision machined steel framework provides a foundation for the linear motion drive system, resulting in superior accuracy and efficiency, thus translating to ultra-smooth cut quality and edge finish. A user friendly, intuitive handheld controller brings the router to life making start up procedure and job set up a quick and easy process. 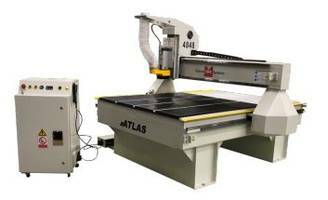 Atlas Series CNC Router from Techno provides ultra-smooth cut quality and edge finish. Digital Cutting System is integrated with optiscout digital software suite. 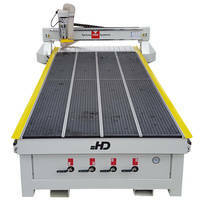 HD II 2436 Tabletop CNC Router System comes with intuitive handheld controller. 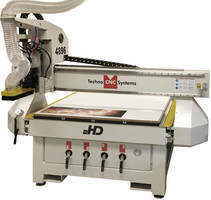 CNC Router is equipped with 23.5 in. raised gantry. 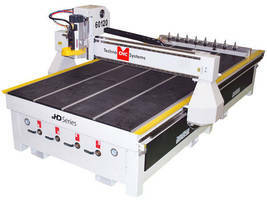 CNC Router offers feed rates up to 800 ipm.